Once school starts up it seems we always have trouble finding the time to fit in a family hike. We had a half day available Sunday afternoon, so we made the quick drive up the Northway to do another one of the Chester Challenge hikes: Meade and Beckman Mountains. Like the other hikes we've done in the Chester Challenge, Meade and Beckman Mountains is short and easy but offers up some great views. My friends Linc Marsac and Lori Phoebe Benton, chief guides and owners of Square Eddy Expeditions, like to say that they get double the fun out of every snowflake that falls: first skiing the woods and mountains around North Creek and Indian Lake, and then paddling the runoff when it all melts in the spring. We weren't paddling spring runoff on our trip down the Hudson Gorge with Square Eddy over Labor Day weekend, but the double-the-fun rule seemed to be in full effect anyway. Back in 1987 when I finished my first round of the 46, there were a handful of peaks I swore I’d never repeat. If you’ve climbed Blake, Couchie or Cliff, you know what I’m talking about. Sooner or later though, I’d get dragged out by one hiking partner or another and notch second and third visits to those “never again” peaks. At the other end of the list are the favorites, the ones you return to over and over, even if it’s a decade between visits. Dix is on that list, 6th highest in the Adirondacks and offering some of the best and most interesting views of the 46. A recent two night stay at Elk Lake Lodge provided the perfect opportunity to climb Dix again. It’s understandable if you’ve never heard of Clear Pond Mountain. As one of several summits in the privately owned 12,000 acre Elk Lake – Clear Pond Preserve, its trail is open only to guests of Elk Lake Lodge. We got a chance to hike the mountain and enjoy its phenomenal views during a 2-night stay at the lodge last weekend. It's not like we've uncovered all the locals' secrets, but in the nearly 10 years that we've been coming to the Outer Cape we've gotten pretty good at finding the off-the-beaten-path spots that most of the tourists miss. My ride the other day took me to some of our favorites along the Truro / Wellfleet border. With an early end to the winter that wasn't and beautiful weather on tap for the weekend, we jumped on the opportunity to break out our hiking boots for an easy, close to home outing. Kipp Mountain is one of several small peaks in the Chestertown area that are part of the Chester Challenge: complete 6 out of the 10 hikes and you're awarded a pin and certificate. You can read more about the Chester Challenge in this blog post that I wrote last Fall. Each year we try to make it up to northern Vermont for at least a day or two of late season skiing. 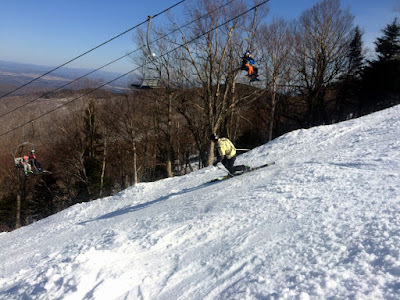 We almost didn't make it this year, but at the last minute pulled off an overnighter to Jay Peak over Easter weekend. At this point in the season a skier’s got to pick his days. You’re going to want new snow or warm temps and spring conditions. Saturday at Whiteface was neither. We had a great day anyway. Sometimes you get lucky. As lousy as this winter’s been, we scored a week of stellar conditions over the February break. Of course it wasn’t pure luck. We stacked the odds in our favor by heading 5 hours north to Mont Tremblant, in the Laurentian mountains of Quebec. Ironically, the locals apologized for low snow conditions upon our arrival. Apologize, for what? With 30 inches of snow on the ground and the mountain 100% open including glades and natural snow trails, it seemed like we had stepped out of late November right into mid-winter. A quick update from skiing Gore last weekend. There’s no sugarcoating the fact that warm temperatures and rain during the January 30 – February 3 period were a significant setback in what has been a tenuous winter all along. Snowmaking and grooming crews were focusing their efforts over the weekend on repairing and re-surfacing the open trails, and by sticking to the trails that had received the most attention we were able to put together a respectable day of skiing, all things considered. I’ve loved every one of the western ski trips I’ve gone on over the last several years, but with the east locked in a snow drought this winter, our trip to Park City, Utah was a godsend. As if on cue, the storm cycle that started the day before our arrival deposited 22 inches of fluff during our stay. And that came on top of what’s already been an excellent snow year in Utah. Looking out over the Adirondacks from the top of Whiteface’s summit lift, you never would have known that a blizzard was raging 250 miles south. While it would have been nice if winter storm Jonas sent some of its snow our way, we sure weren’t complaining. With blue skies, cold air and some of the best snow conditions this winter, we had one of our best ski day so far this season. News flash: It’s been a lousy winter for skiers. No significant natural snow and record warmth in December. Thin cover and limited terrain have been the name of the game Day 1. Temperatures have gotten closer to seasonal norms since the first of the year, but we’ve still had thaws and rain on what seems like a weekly basis. But finally we’ve officially crossed over from “early season” to “mid-winter” with the opening of much of Gore’s summit terrain, opening the door to the best skiing so far this year. After a three week absence, it was great to be back at Gore with nice snow conditions and some new terrain options. Crowded, frozen granular, overcast. On the surface, pretty crappy conditions. Somehow we managed to have a great time.